but you will never break us. is simply the way things must be. they are destined to fall. to the gears of an inhumane system. where life once grew and will grow again. This entry was posted in Civil Rights, Economic Justice, Environmentalism, Health Care, Homelessness, Human Rights, Hunger, Immigration, Interfaith, Poetry, Police Violence, Politics, Poverty, Prayer, Prison Justice, Religion, Simchat Torah, War on March 23, 2018 by Rabbi Brant Rosen. While I’m sure that Syria has been on the lips of many a rabbi this High Holiday season, I’ll be honest with you: I’ve struggled with whether or not to give that sermon this year. Not because I don’t consider it to be an issue of critical importance, quite the contrary – no one can deny that the situation in Syria is a tragic and critically important one in our world at the moment. If I’ve been hesitant, it’s only because I’m not really sure I have much to add to the myriad of political analyses we’ve heard in the media these past few weeks. So while my words to you today are not directly related to Syria, I would like to begin with one small but powerful story out of this crisis. It comes from an article written by my friend Aziz Abu Sarah, a young Palestinian peace activist and educator. At the moment Aziz is the Co-Executive Director at the Center for World Religions, Diplomacy and Conflict Resolution at George Mason University – and he was recently made a National Geographic Emerging Explorer where he serves as a cultural educator. Several JRC members know Aziz well as he was one of our tour guides of a JRC trip to East Jerusalem and the West Bank two years ago. As the news out of Syria became more and more dire, particularly the news of the growing refugee crisis, Aziz and a colleague put their heads together to explore some kind of action they might possibly take. There are currently more than 2,000,000 Syrian refugees in camps throughout the Middle East – mostly in Lebanon, Jordan, Turkey, Iraq and Egypt. Women and children make up three quarters of the refugee population. There are over 1,000,000 children refugees as a result of this crisis. When I read Aziz’s post, it reminded me how easily we debate these crises even while knowing so very little about the people who are actually living through them. How we tend to view these kinds of global tragedies in the abstract. It’s understandable, of course – when we read the staggering statistics coming out of these crises zones, it literally staggers our comprehension. How on earth do we grasp numbers such as these, let alone the reality of the suffering behind the statistics? But while it’s understandable, I do find something profoundly troubling about this phenomenon. Because when we reduce people in crisis zones to abstractions, it invariably creates a kind of emotional callousness in the ways we think and form our opinions about the crises themselves. When we don’t make an effort to understand the human reality behind the headlines, it seems to me, our political ideas emerge in something of a moral and emotional vacuum. I do believe that Aziz is absolutely right: before we start holding forth on whether or not to bomb, we must first open our hearts and find compassion for the people of Syria. We must make an effort to learn who they are, to learn about their unique experiences, to listen to them. Whatever we believe must be done, the process by which we form our opinions must begin with an effort to get to know the human beings behind the abstractions. Now I realize that most of us don’t have the wherewithal to pack up and move to Turkey to work with Syrian refugees – but this doesn’t let us off the hook. Because quite frankly, we don’t have to literally go to the Middle East to discover populations at risk. While Syria has been at the center of the headlines of late, in truth there are all too many of communities in crisis in our midst. We don’t have to go all that far to find them. Indeed, this is another way that our abstractions affect our perception of the world. Crises are things that happen “over there.” To be honest, sometimes it seems to me that we relate to the at-risk populations in our own backyard as if they are as far away as the Middle East. But of course, they’re not. They are right here, right outside our very door. They may not be of the same magnitude of those in places like Syria, but they are all too real nonetheless. Here’s but one example, from right here in Chicago. 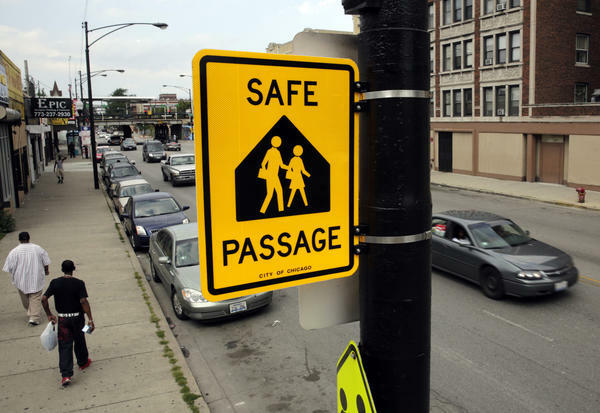 Many of you, I know, are familiar with the initiative known as “Safe Passage” a program formed in 2009 as a response to gang and street violence in at risk Chicago neighborhoods. The program places community workers wearing bright fluorescent vests near public schools as a presence that will help create “safe passage” for High Schoolers who were walking to and from school. The program was expanded significantly this past May, after the Chicago School Board closed almost 50 public elementary and middle schools in predominantly African-American and Hispanic communities on the South and West sides. Among the many devastating impacts of this decision was that it forced many children to walk longer routes to their new schools, through additional dangerous neighborhoods and across multiple gang boundaries. Whereas these children had previously walked an average of a few blocks to their neighborhood schools, many of them now have to walk half a mile or more through areas that are, quite literally, battle zones. To deal with this reality, the school board expanded Safe Passage, hiring an additional 600 workers at $10 an hour to serve 12,000 schoolchildren in at-risk communities on their way to their new schools. While it is still early in the new school year, the preliminary reports are not promising. There have already been reports of violence along Safe Passage routes – not including the myriad of areas where children are not served by the program. We are now hearing reports that overwhelmed workers are quitting or just not showing up for work. One alderman has suggested the use of drones to protect children along Safe Passage routes. No, we don’t need to look far away to find stories of children in battle zones. They are, in a very real way, right outside our door. Except it’s not. It’s happening right here in our very own community and in communities just like it across our country. These populations may not be terrorized by tyrannical dictators or civil war, but their lives and their families’ lives are at risk in a very real way. As a parent, I cannot fathom how it must feel to raise my children in neighborhoods wracked with violence, to send them off to walk miles to school through gangland battle zones. I cannot begin to fathom it. And maybe that is part of the problem. This Yom Kippur, the season when our community honestly takes account of itself and how we might collectively atone, I think it is eminently appropriate to ask ourselves: what has been our response to communities in crisis? And are we truly able to see them? Have we truly opened our eyes and our hearts to their realities – particularly those who live right here in our own nation, our own city? I can’t help but wonder what our communities would look like if our public policy was guided by such an approach. Let’s return to the example of Safe Passage that I gave earlier. There is no doubt that Chicago Public Schools, like all major urban school districts, faces daunting challenges. But unfortunately in my opinion, the Chicago School Board, like so many other urban school boards, now seeks to address these challenges from a corporate, efficiency-focused mindset rather than a community-based one. I believe this approach to public education is problematic on many levels – but perhaps the most troubling is the way it has utterly blinded us to the critical role neighborhood schools play as the bedrock of our communities – particularly our at-risk communities. In areas that have already been profoundly destabilized by massive cuts to public services, neighborhood schools have served as the only real glue that holds these communities together. By closing these schools, CPS was in many cases literally cutting the final piece of government investment in these communities – and the last remaining institution in which residents can invest in one another. It is impossible to understate the devastation these kinds of decisions inflict on low-income communities that have long been seriously at-risk. For decades, in fact, urban renewal policies have been decimating neighborhoods, uprooting residents who are largely poor and people of color. Neighborhood assets, like churches, stores, and parks that have been important community centers for generations, have become abandoned or have disappeared. And so residents have been forced out – they have become refugees, in as sense, of a different sort. The neighborhood school is often the one institution still surviving in low-income neighborhoods and it has historically served as points of pride and community for families. If you had any doubt that these schools are important to their neighborhoods, you had only to listen to the thousands of parents who attended community meetings on school closings over the past few months. Despite their pleas, however, our new “education reformers” have chosen to close schools rather improve them, using the argument that we are in a time of public sector austerity and that we need to orient them to market forces. This is what happens when leaders view schools using a corporate model rather than a community-based one. When CPS closed 50 neighborhood schools and slashed the budgets of those that remained, Chicago’s non-elected board addressed this issue with a top-down mindset that was ultimately divorced from the real-life reality on the ground. And so now we have it: thousands of students are now leaving their already devastated neighborhoods every day are forced to walk through battle zones in order to get to their schools. Of course this phenomenon is not only restricted to our schools. In too many ways, our public policy is guided by the corporate goals of efficiency and profit over community and the greater good. While it is certainly true that many of our public institutions are bloated and inefficient and in need of reform, when we destroy them wholesale in this manner, we fail to reckon with the very real human cost of these actions. Even worse, when we privatize our public works, whether it is public housing, our health care system, or our prisons, we do more than simply turn lives into abstractions. We increasingly view human lives – and in some cases, human misery – as commodities to be profited from. Whether we call this privatization or neo-liberalism whatever we choose to call it, I do believe it represents a very real form of institutional oppression. It may not be as obvious or as brutal as the oppression meted out by the Bashar Al-Assads of the world, but I submit it is a form of oppression nonetheless. Both stem from a view of our neighbors as somehow “other.” Both benefit from a more privileged people’s willingness to turn a blind eye. And most important, both forms of oppression affect the real lives of real people. So what is there to be done? On an individual level, I think, one answer is very simple: we need to connect. We need to venture out of the hermetically sealed worlds we too often construct for ourselves and learn more about the people with whom we live – particularly those whose day-to-day reality is fundamentally different from our own. Earlier this month, I read an article by a German journalist who was in Chicago to write about urban gun violence through a grant from the Pulitzer Center. It was fascinating to read the impressions of this European visitor from a Berlin, a city larger than Chicago but with a fraction of the homicides. It is human nature to ignore Chicago’s gun violence as long as the shooting stays in the “bad” neighborhoods. Don’t take the “L” down south — that was the advice I always heard when I spoke about visiting less-fortunate neighborhoods. I ignored the advice and nothing happened to me except that I got to know the city. I discovered that it’s not just money that needs to be thrown at these neighborhoods. They need economic opportunity, education, health care. They need a Chicago that is not a segregated city. They need people who care. Take a different path, reach over the walls. I know many JRC members who work and volunteer with in at-risk communities in Chicago and right here in Evanston – and I have learned a great deal from them over the years. I think it would behoove us all to not just to learn about these communities, but to create real connections, nurture real relationships. To meet and listen to those who live there. To relate to them as real people, not as charity cases to be helped or problems to be solved. To learn about their reality, their struggles, their needs, from them, not news reports or politicians or pundits. We need to learn and act on an advocacy level as well. Here in Chicago, there is a remarkable grass-roots coalition that is shaping up and organizing on behalf of the at-risk communities in our city. In fact, polls show that 60% of Chicago’s citizens oppose the school closings and they are starting to make their voices and their presence heard in a major way. After the CPS’s announcement, many of us took to the streets for three straight days of marches in protest – and although the school closings and budget cuts are now a reality, they have galvanized a movement that is attracting a remarkable coalition – including growing numbers of young people. But this movement has not grown up overnight – and it is not simply focused on the issue of public schools. It has in fact been building steadily over the years; it is the product of many community-based organizations mobilizing and organizing on behalf of the most vulnerable members of the greater Chicago community. I’m proud to say here at JRC we are becoming increasingly active in this movement. I encourage you to find out more about our efforts and seriously consider lending us your support. Specifically speaking, I encourage to consider getting involved in our Labor Justice Task Force, our Immigrant Justice Task Force and to speak with JRC members who are currently exploring ways we can become active with Northside P.O.W.E.R., an institution-based people’s power organization with members on the Chicago’s North side and in North Shore Communities. I also want to encourage us all to educate ourselves and find ways to act on a national level as well. Indeed, it is not an understatement to say that the at-risk populations in our country are currently vulnerable in ways we haven’t seen in decades. According to new data from the US Department of Agriculture, more than one in five American children face hunger, this at a time in which our Congress is considering cutting the SNAP program (aka food stamps) for more than 800,000 Americans who currently receive them but still do not get enough to eat or maintain only a barely adequate diet. The crisis facing our food stamp program is a particularly critical issue at this very moment – and I would be extremely derelict if I devoted a sermon to our at-risk populations without mentioning this. According to a new report released just a few days ago by the Agriculture Department, food insecurity in our nation remains at a stubbornly high 14.5 percent. According to these statistics, one in five American children are currently facing hunger. Thanks to the stimulus package, we’ve been able to address this issue through the SNAP program, which last year served 47 million Americans to meet their basic nutrition requirements. However next week, House Republicans, in an effort led by Representative Eric Cantor, will vote to cut $40 billion out of the food stamp program – an act that would literally force hundreds of thousands of Americans into food insecurity. There are 50 million people in the United States of America who are hungry, 17 million are kids. It is something we all should be ashamed of, and the United States House of Representatives is about to make that worse. This is a big deal and my hope is that we’ll treat it as such and not just let it go by without a lot of discussion and debate because we’re all focused on Syria. Now these cuts are unlikely to become law since the Senate would never pass them and President Obama would certainly never sign them. But the very fact that such a bill could even be voted on in the House is a clear sign that those advocating for the poor and the hungry in our country must remain incredibly vigilant. We simply cannot let our foreign policy discussions, however important, to eclipse these critical issues facing at-risk citizens here at home. Every Yom Kippur, we recite our prayers in the first person plural. When we seek atonement, hope and healing for the New Year, we don’t do so for our own individual selves – we ask for these things on behalf of our entire community. I would claim that in this day and age it is getting harder and harder for us to connect with this aspect of our Yom Kippur prayers. Increasingly, it feels to me that we liturgical lip service to the concept of community. Too often it seems like we’re all living our parallel lives, without the sense that at the end of the day we’re all somehow in this together. But in fact, we are. I do believe this sense of living separately from one another is itself the illusion. At the end of the day, our fates are intertwined. We’re very much mistaken if we believe that we’re somehow immune from risk. As we all know too well, the middle class is being squeezed and endangered in ways we haven’t witnessed in decades. Over the years and even now, there have been JRC members living on the verge of hunger and homelessness. These problems are not somewhere “over there” and in truth, they never really were. Perhaps it’s only our individualistic 21st century perspective that has changed. So this Yom Kippur, I’m suggesting a recalibration of our spiritual perspective. To view the risk to the well-being of some members of our community as a risk to our own well-being. In a very real way, to own the danger and let go of our illusions of invulnerability. Otherwise, what do all of these prayers really mean? What do our lives really amount to if we cannot somehow see them as integrally connected to the lives of others, whether they live in Syria or the Southwest side of Chicago or in Evanston? May this be the new year we let go of our illusions. May this be the year we decide to share the risks as well as the rewards. May it be a rewarding year for us all. This entry was posted in Current Events, Economic Justice, Education, Food, Health Care, High Holidays, Homelessness, Hunger, Immigration, Judaism, Labor Justice, Politics, Poverty, Prison Justice, Refugees, Religion, Sermons, War on September 16, 2013 by Rabbi Brant Rosen. The week before our delegation left for Rwanda, the New York Times ran two newsy features on the country. The more positive piece explored Rwanda’s improved state of the nation’s health care. By distinct contrast, a more ominous feature described the growing reports of human rights abuse by President Paul Kagame’s regime. In Rwanda, it seems, it is the best of times and the (not quite) worst of times. As our youth participant Ben Feis pointed out in his post last week, signs of Rwanda’s success are everywhere. The infrastructure is demonstrably more substantive than our last visit four years ago and NGO’s such as WE-ACTx report that health care is currently reaching more and more Rwandans – particularly women and children. And yet, as Ben so eloquently wrote, there is something of a veneer quality to these successes. 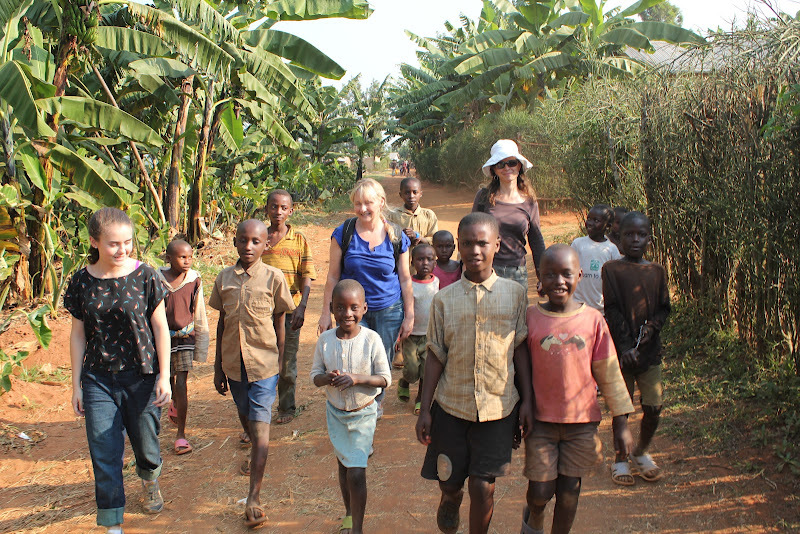 Despite the obvious economic growth, we met many Rwandans struggling just to survive. Though the horrors of the genocide are now part of the past, many believe that deep tribal enmities still lurk just beneath the surface. Though Rwanda is one of the safest, cleanest and and least corrupt countries in Africa, many believe that Kagame’s iron fist rule could ultimately inspire more – not less – conflict in the future. As ever, the real heroes on this trip were the ordinary citizens and organizations working tirelessly – and often against all odds – to bring a life of hope and dignity to their communities. 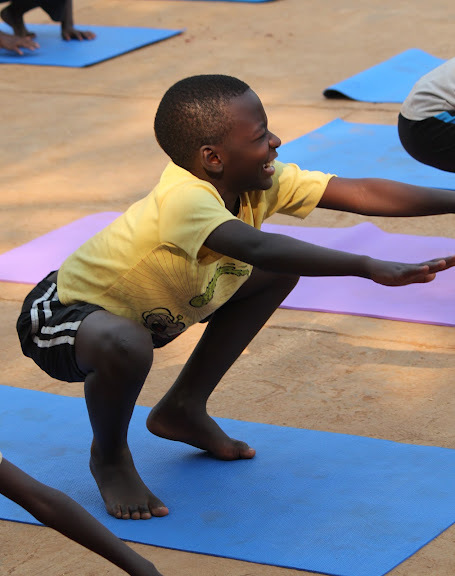 The young man with HIV who now teaches yoga to HIV-infected children. The wife, infected by her husband who died of AIDS, who kept his family from taking her house away from her. The expectant mothers who met in order to learn how to keep their babies contracting HIV – and eventually remained together to form a jewelry making cooperative. The ex-poachers who now earn and income through environmental conservation and cultural preservation. As my fellow participants would attest, this list of heroes could go on and on and on. As a Jew, I think a great deal about what it means to a community to heal and rebuild after experiencing the trauma of genocide. 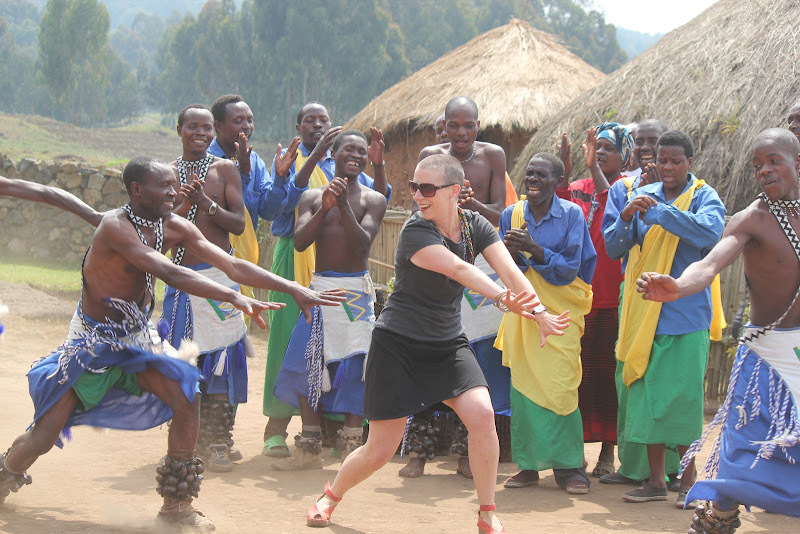 While the Rwandan example is different in many ways, I can’ t help but believe that certain experiences are quite universal – not least of which is the desire to face up to a painful past without becoming consumed by it. In the end, despite all the challenges and potential pitfalls faced by the Rwandan nation, I believe the courageous efforts of her citizens – and those who support them – have much to teach us all. (The) bus drops us and we are swarmed with locals, fascinated by the muzungus – the wealthy, white folk. Lilliane fetches us and we cross a rickety bridge into her neighborhood. I feel like I am in the bowels of the Old City in Jerusalem where streets are like a cobblestone maze and no one speaks English. Heartfelt thanks to JRC member and organizer Elaine Waxman yet again for her visionary guidance and leadership on our trip. May we all be worthy to live up to the lessons we’ve learned these past two weeks. 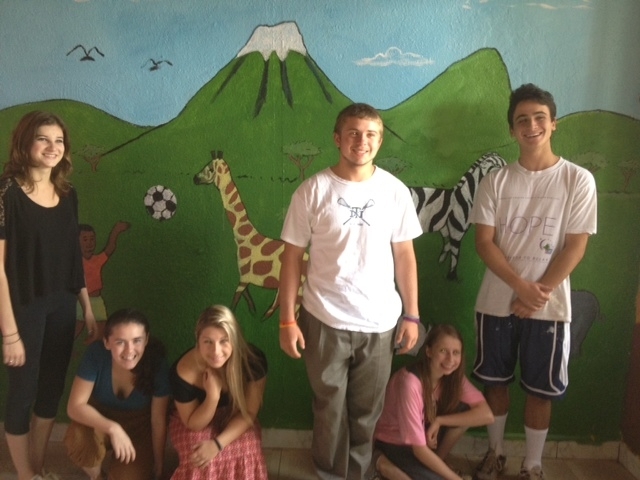 Left to right: Ben Feis, Sara Fox, Katia Waxman, Rachel Pinkelman and Seth Fox, posing after painting and assembling the new WE-ACTx children’s library (Katia’s Bat Mitzvah project). WE-ACTx youth yoga program, Project Air. 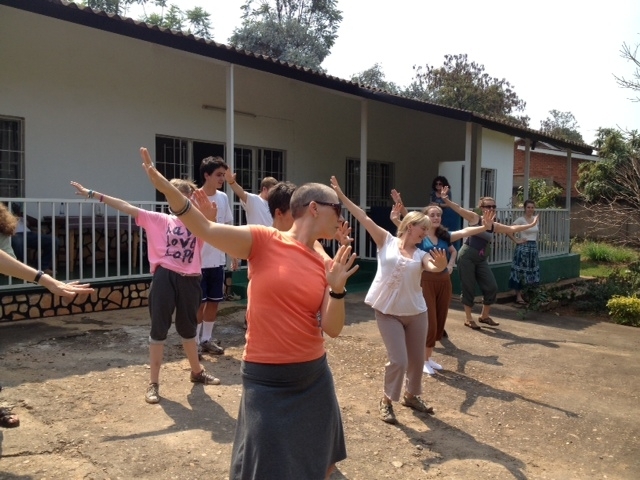 This entry was posted in Global Activism, Health Care, HIV/AIDS, JRC Rwanda Trip 2012, Poverty, Rwanda, War, Women's Issues on July 23, 2012 by Rabbi Brant Rosen. 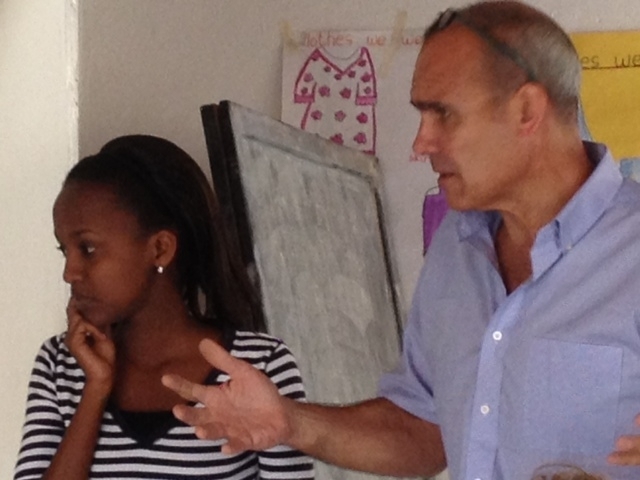 As promised here is a guest post from one of the youth participants on our trip. Ben Feis, 18, is a recent graduate of New Trier High School in Winnetka, IL and will be attending the University of Pennsylvania in the fall. 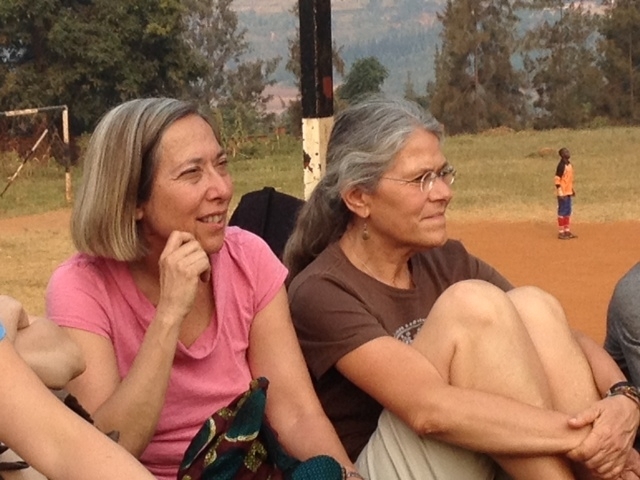 My experience in Rwanda thus far has been truly remarkable and eye-opening. At first, I was struck by how developed certain parts of Kigali are – I suppose that like many, I was expecting a dirt runway at the airport, very few automobiles, and certainly no tall buildings. This is simply not the case. Parts of urban Rwanda actually have quite a bit of infrastructure. As the days have gone by, though, it has become more and more apparent that there exist two worlds here. You may walk through a suburb of Kigali and find that directly across the street from a newly-constructed mansion (by African standards), a single mother is trying to raise eight children in a tiny room buried among hundreds of others in a filthy shantytown. 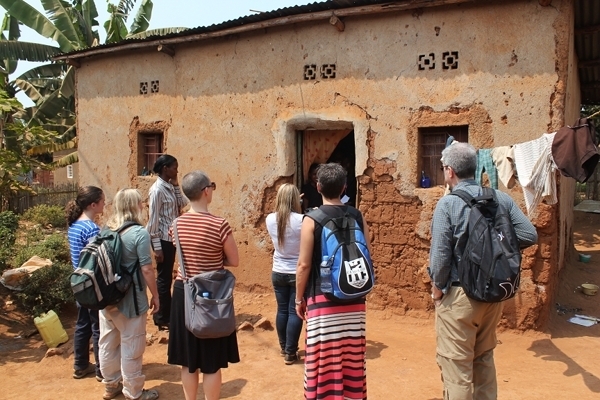 Our home visits have shown us firsthand the extreme poverty in which so many Rwandans live. Many of WE-ACTx’s peer parents themselves, who manage to dress nicely and carry a sunny disposition by day, return to the slums at night, where sewage runs through the alleys and electricity is considered a luxury. As if this isn’t enough of a hardship, many of the people we have met are suffering from HIV/AIDS. What I find most amazing, however, is the ability of a surprising number to remain positive despite their setbacks. In a country that was ravaged by vicious genocide and pure hatred less than two decades ago, so many Rwandans we have met are incredibly genuine, kind, earnest, and polite. Whenever we enter a room, every single person, young and old, is there to extend a hand and welcome us. Most are quite soft spoken, but as they have shared their life experiences with us, I feel that I’ve developed a personal connection with each and every one by the time we have to go on to the next house. Not everyone is able to maintain such a positive outlook on life, though. As we were visiting several homes today in one of the rural, mountainous regions, we met one woman in particular who seemed on the brink of despair. She could not bring herself to smile and appeared in pain as she told us of the financial difficulties of putting food on the table and sending her children to school. Mind you, the cost of sending one child to secondary school for a year might be around 36,000 Rwandan francs (or $60). Still, these costs are often too much for a family to handle, and so the children are left with nowhere to go but to continue the cycle of poverty. As we were leaving this woman’s home, she asked us, “Now that I have told you about my family and our circumstances, is there anything you can do to help us?” Most families we visited did not have the audacity to come out and pose such a direct question, but it is indeed the reason we are here. David (from CHABHA) assured her that several of the NGOs in the area would try to implement some type of economic self-sufficiency programs in the near future, but I can’t help but think that most of us would have wanted to hand her a $20 bill (or the equivalent in Rwandan francs) right then and there. But therein lies the fundamental problem of what it means to be charitable in a third-world country: is it better to give a man a fish, or teach him how to fish? Fortunately, there are already a number of organizations doing excellent work here in vocational training, co-ops, and so on. Clearly though, it’s not enough. I’ve said it again and again over the past week: this has been the experience of a lifetime. I’ve learned an incredible amount about what the world is really like on this trip. But has it truly been a life-changing trip? As I return to my cushy lifestyle on the North Shore, the question still remains: how am I going to make a difference? If learning about the world for my own sake is all I take away from my experiences, then I really have accomplished nothing. Judaism teaches the value of Tikkun Olam or repairing the world. I would argue that not only is it a value that should be encouraged, but a responsibility that each and every one of us needs to own. Until this problem is fixed, we cannot sit idly by and expect others to take action. It is everyone’s duty and I can assure you, there is much work to be done. This entry was posted in Africa, Global Activism, Health Care, HIV/AIDS, Hunger, International Health, JRC Rwanda Trip 2012, Poverty, Rwanda on July 16, 2012 by Rabbi Brant Rosen. On Thursday we shifted our volunteer efforts to CHABHA (“Children Affected by HIV/AIDS), an international NGO that supports grassroots projects in Rwanda and Burundi that care for orphans and other children affected by HIV/AIDS. 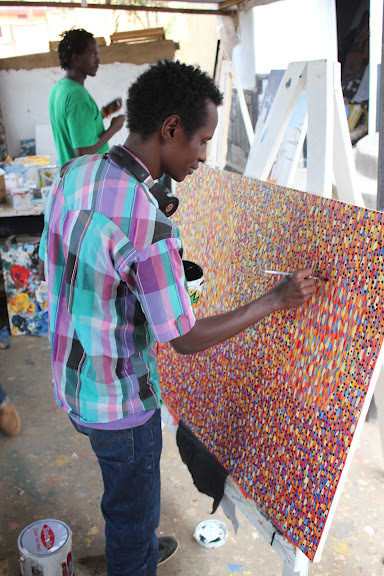 In Rwanda, CHABHA works with three neighborhood organizations: AMOHORO, which is located in in Kucyiru, Kigali, AGAPE, in Kicukiro, Kigali, and AJESOV in Nyamata (about an hour south of Kigali). One of CHABHA’s most important functions is to accompany association workers on their regular home visits to the families they support. These visits help CHABHA and local association staff to track the status, needs and conditions of these households – on a deeper level, they clearly enable workers to establish deep and lasting relationships with those they are serving. In some ways it seemed to me that these regular connections provided nothing short of a spiritual life line to these families. 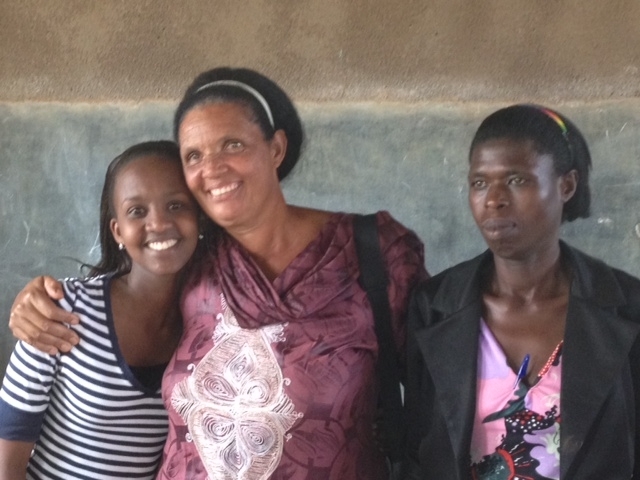 For our first series of home visits, we traveled to the AGAPE association in the Kicukiro district of Kigali and and accompanied CHABHA staff person Micheleine (above left), AGAPE administrative assistant Anna-Marie (middle) and AGAPE worker Grace (right). It’s hard to describe the emotional impact these home visits had upon us – and we’re still having a hard time sorting through the intensity of visiting these families, home after home. On our first stop, we visited a single mother of four. Her home, like almost all the homes we visited, was made of mud brick. She welcomed us graciously and our group crowded in her small, very dark living area. Her home only had one other room – a smaller bedroom area separated from us by a curtain. Anna-Marie spoke with her and Micheleine interpreted for us. The mother and her children were all HIV positive. For her regular job, she washed clothes for her neighbors, but at the moment she was too ill to work and as a result, she has no food to feed her children. (Malnutrition is a huge problem for individual with HIV/AIDS because the ARV medications do not work if they are not taken with food.) She also told us that she used to have some rabbits (that CHABHA supplies to be raised, bred and sold for food) but they were recently stolen. We were overwhelmed with the enormity this mother’s despair. At the same time I couldn’t help but be struck by her innate sense of dignity. Though she was clearly feeling unwell, she was deeply gracious to us and obviously wanted us feel welcome in her home. 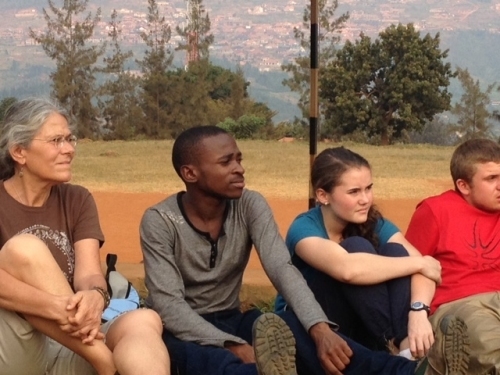 At the end of our meeting, Anna-Marie said a prayer for her and her family in Kinyarwanda. I asked if I could say a short prayer for her in Hebrew; Anna-Marie said of course. After I concluded a Mishabeirach (Jewish prayer for healing), the mother then offered a prayer for us. We five more homes before we finished. By the end, we were overcome by familial circumstances more dire than any of us could ever comprehend. While it sometimes felt as if the support offered was but a drop in the bucket of in terms of their sheer need, by the end we came to realize that NGOs such as CHABHA and local neighborhood associations such as AGAPE are the real front line heroes in addressing the scourge of extreme poverty. Anne-Marie, for instance, is far more than a neighborhood association worker – she is clearly is a spiritual matriarchal figure for the families of AGAPE. There are many more similarly powerful stories I could tell about out myriad of CHABHA home visits that we made between Thursday and Saturday and I hope perhaps I’ll try to add one or two more before I’m through blogging our trip. (One postscript about our first visit: at the end of the day, we returned to the CHABHA office. When we told David about the mother’s situation. He said that in extreme cases like this – i.e., in which families were unable to feed themselves – CHABHA workers revisited immediately with emergency food provisions). After lunch one of our groups visited an organic learning farm and agronomy class run by CHABHA in partnership with (yes, yet another international NGO), Gardens for Health. 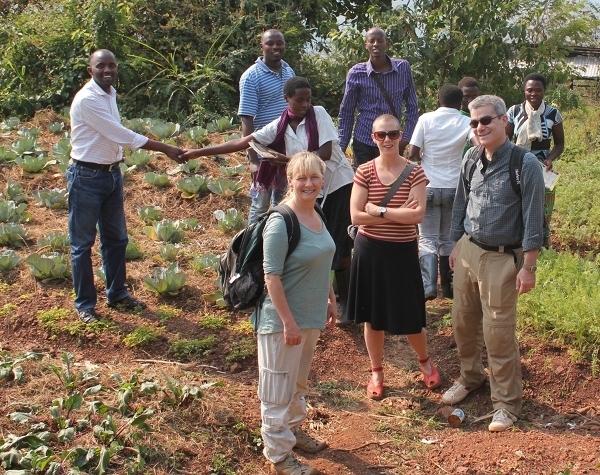 The garden and class were located at a school on the edge of Kigali. 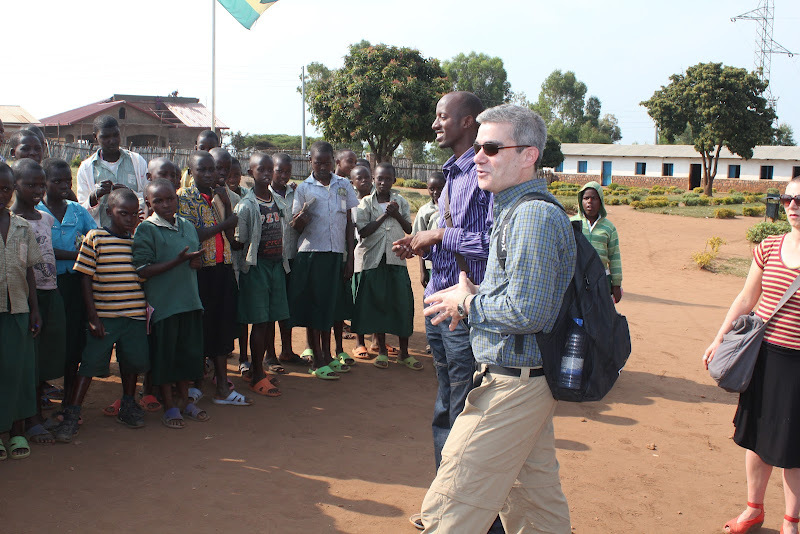 Getting to the site was an adventure in itself, bouncing up and down in a truck up and down a winding rutted road until we reached the school in the Bumbogo district. We met with Samuel, the agronomy teacher, who showed us their learning garden (above), which was lined with rows of beets, cabbage and carrots. The ground was dry and rocky, but the crops appeared quite lush. Samuel (back row, middle) said that as part of their organic farming curriculum they raise local livestock and use the manure for composting. Though few of these children have much land to speak of at their homes, the intention is for them to take this knowledge and cultivate kitchen gardens for food and income generation in their communities. Samuel shared their very extensive agronomy curriculum with us, after which the students introduced themselves to us one by one. More than a few explained that they were taking this class to help their communities with their new-found skills. We were then asked to introduce ourselves to the class – and asked to mention our favorite vegetable. (Elaine: swiss chard, Rich: cabbage, Me: tomatoes). During Q &A, Rich Katz, ever the passionate Middle School teacher, asked the students too divide up into four groups and decide among themselves what they thought were the most effective methods for retaining moisture in earth after watering. (One boy looked at me, smiled, and said “No problem!”) They came up with a variety of spot on answer: spreading leaves next to the crops, using plastic, using drip irrigation, etc. By far our favorite Q &A moment occurred when they were asking us questions. One boy, maybe thirteen or fourteen asked Liora if she was single. As you might expect, hilarity immediately ensued. While we were in Mubogo, the other half of our group stayed at the CHABHA office, where they sat in on classes with Project Independence, CHABHA’s after school vocational training program. 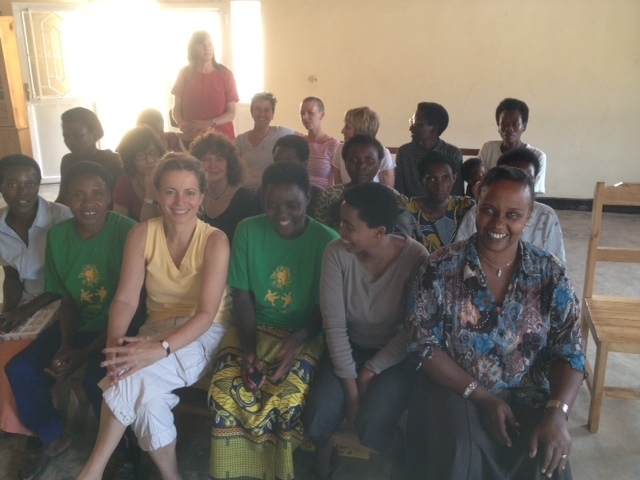 Another smaller group went back to Nyaconga, to put the finishing touches on the WE-ACTx jewelry coop space. There was, needless to say, much to share around the dinner table on Thursday night. Friday morning, we’re visiting AJESOV, another CHABHA-supported association located in Nyamata. On the way we will be visiting two well-known genocide sites that are now maintained as memorials. More on this in my next post. This entry was posted in Africa, Children's Rights, Economic Justice, Food, Global Activism, Health Care, HIV/AIDS, JRC Rwanda Trip 2012, Poverty, Rwanda, Water, Women's Issues on July 15, 2012 by Rabbi Brant Rosen. On Wednesday we were back at the WE-ACTx office to finish assembling the new children’s library. The library itself was originally the brainchild of JRC member Katia Waxman, who created the idea for her Bat Mitzvah social action project last year. 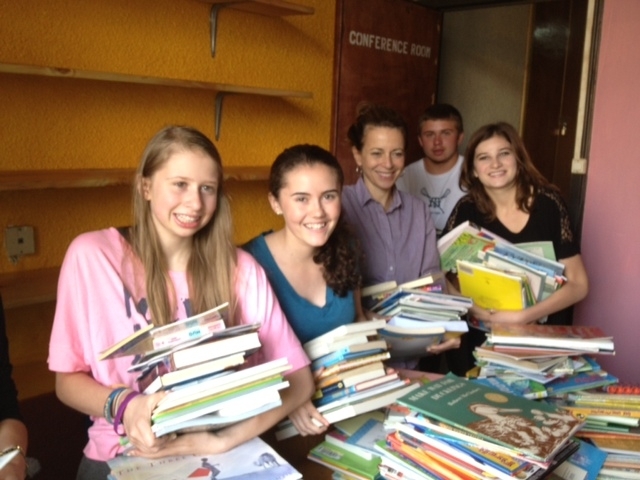 Through her efforts, 450 books were donated, which she and her mother (trip coordinator Elaine Waxman) brought over from Chicago. (That’s Katia above, second from right, Sara Fox, far left, Brenda Feis, third from left, Seth Fox and Rachel Pinkelman). When we arrived at the office Wednesday morning, we discovered that William had finished the mural (below) and the wall shelves had been finished and installed. We spent the morning sorting through the books and arranging them. 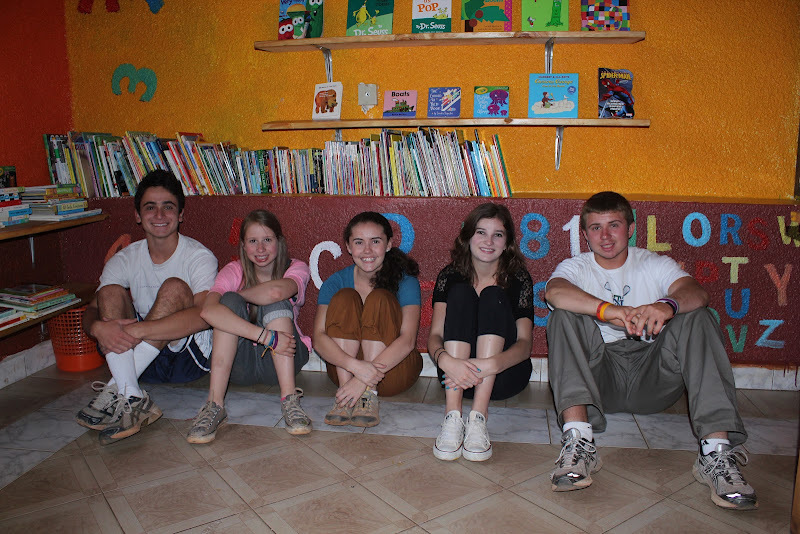 When we finished, Katia’s project was finally complete – a wonderful legacy to leave to the children of WE-ACTx. Afterward, we split up into groups and visited the homes of three different Peer Parents, giving us the very special opportunity to get to know them and their families in a more personal setting. These visits completed our last full day with WE-ACTx, although five of our group will go back tomorrow to the jewelry cooperative to complete the work in their showroom. 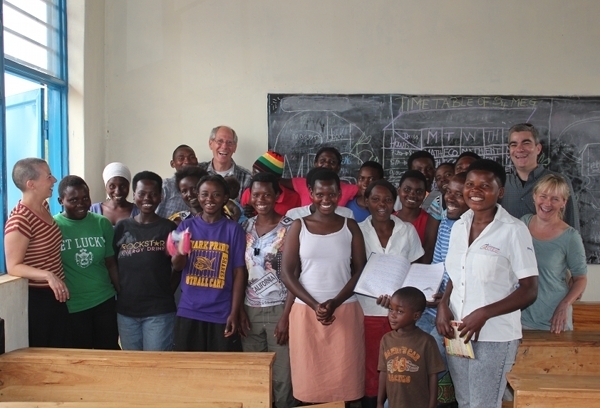 A few words on this particular project: it began when a group of women met through a “Preventing Mother to Child Transmission Program” at WE-ACTx’s Nyacyonga clinic. The women (with us, below) decided to form a craft collective to generate income to buy baby formula as an alternative to breastfeeding in an effort to reduce the risk of transmitting the virus to their babies. They initially produced woven plastic shopping bags, but eventually settled on craft jewelry – they are now a fully licensed cooperative that they named, “Ejo Hazaza” (“Tomorrow”). 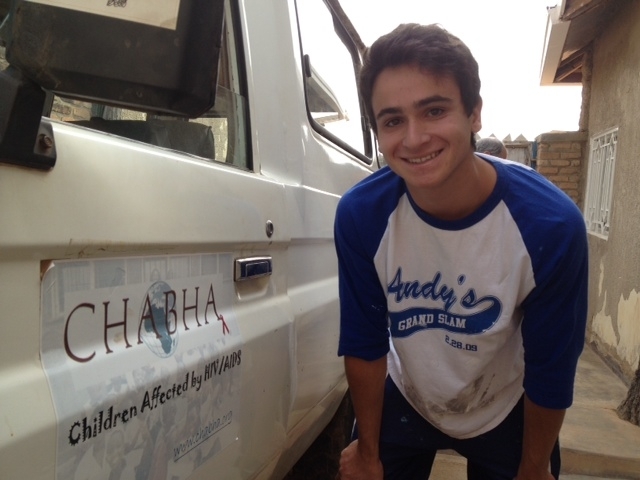 Speaking of tomorrow – our volunteer efforts will focus on the work of CHABHA – another inspiring Rwandan NGO. This entry was posted in Africa, Children's Rights, Economic Justice, Fair Trade, Global Activism, Health Care, HIV/AIDS, International Health, JRC Rwanda Trip 2012, Rwanda, Women's Issues on July 13, 2012 by Rabbi Brant Rosen. Our Sunday began with a visit with the leaders of the WE-ACTx “Peer Parent” program. Peer Parents were created in 2010 with the hope of creating youth leaders from within the ranks of WE-ACTx youth, creating constructed family units of children and young adults with HIV-AIDS who could provide bonding and support in nurturing group settings. There are currently 12 groups ranging in age from 10- 15 – there are also some groups for younger adults from 24-30 as well. The Peer Parents themselves are clinic patients at WE-ACTx as well, which gives them the ability to serve as very real role models for the children: healthy, strong young adults who can can their trust, educate them on the importance of taking their ARV meds, and give them hope about their future. The Peer Parents are truly an impressive community unto themselves – smart, charismatic young people with remarkable leadership skills and sensitive understanding of how to live with a serious chronic illness with dignity and purpose. Since it was Sunday, we meet with all the Peer Parents for their “Supervision Sunday” session, which they devoted wholly to a discussion with our group. Each of them spoke with us openly and honestly about the challenges and joys of being a “parent” to their “families” – helping them to open up about issues such as stress, depression, family issues, drug abuse, and the importance of taking their meds regularly. Our session ended with the Peer Parents leading us all in a group game similar to the one we did on the previous day. In my previous post, I referred to the “power of silly games.” I know now they were much more than that. These kinds of exercises built trust, skill, self esteem, and most of all, I think, as sense of safety in a group that becomes an important surrogate family for many of these children. After lunch we visited Islamic Center in Nyamyrambo, (one of the sites we visited four years ago) where WE-ACTx rents the extensive grounds for many of their ongoing youth programs. We brought along forty yoga mats that we brought from home, as WE-ACTx has recently began a successful youth yoga program, Project Air. Due to a shortage of mats, the younger children could only do standing poses – so our arrival with forty five mats occasioned no small excitement among the children. They watched as we laid them down in rows; when we were done, they lept on them as if they were jumping into swimming pools. They then were led in a fabulous yoga session by Joseph (top clip) a Peer Parent and extremely talented youth yoga teacher, who clearly knew how to make yoga real and fun for young children. It was almost as much fun for us to watch – especially knowing that many of the kids were clearly relishing the opportunity to show off their skills for their guests. I can’t say enough about these young leaders, possessed of formidable skills attained against all odds, now mentoring the children of their own community. As is sadly the case in so many communities throughout the US, I can only begin to imagine how far they’d go in applying their gifts if they lived a society that afforded them greater opportunities. In the meantime, they’re making a very real and transformative difference, child, by child, here in Rwanda. And that in itself is truly an inspiration. Below, two more amazing people who truly inspire us: WE-ACTX’s Mardge Cohen (Left) and Mary Fabri (right). 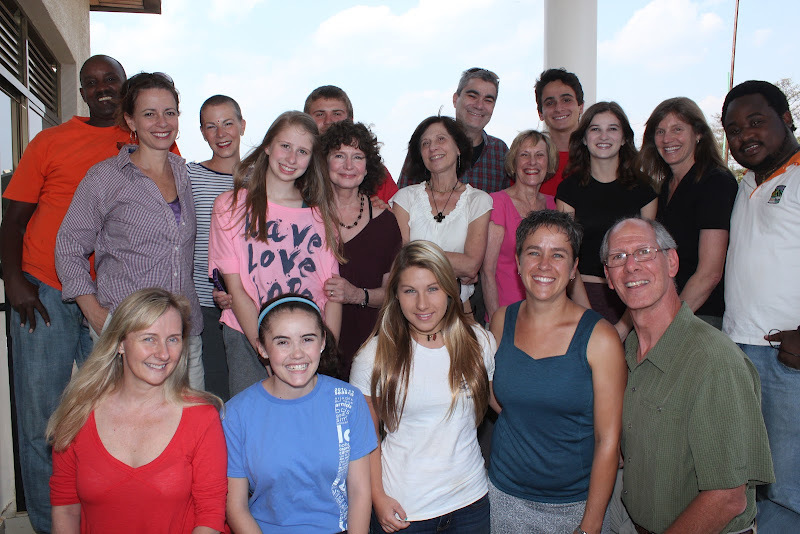 This entry was posted in Children's Rights, Global Activism, Health Care, HIV/AIDS, JRC Rwanda Trip 2012, Poverty, Rwanda on July 10, 2012 by Rabbi Brant Rosen.